Shirts With Random Triangles: Dan Mullen slams websites calling for college football coaches to be fired. 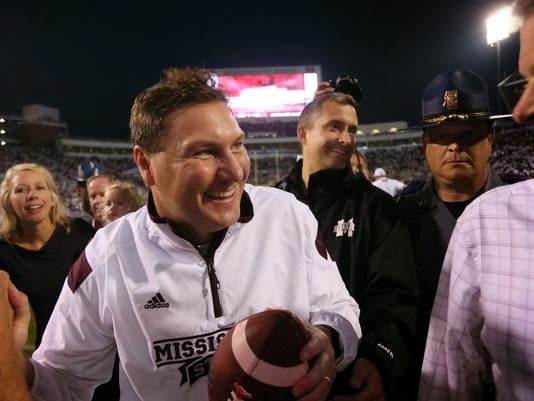 Dan Mullen slams websites calling for college football coaches to be fired. Dan Mullen. Photo via Jackson Clarion-Ledger. College football fan-created websites calling for the dismissal of one underperforming head football coach or another have been popping up ever since the infamous Fire Ron Zook first appeared on the Internet almost as soon as Zook was hired to replace Steve Spurrier at Florida. Now with another Florida head coach, Will Muschamp, under fire, the trend is coming full circle with at least two sites on the Web calling not only for Muschamp's firing, but to replace him with Dan Mullen, head coach of the current USA Today Coaches Poll number one college football team in the county, Mississippi State. As for Mullen himself, he isn't too fond of the idea of websites calling for head coach regime change. He shared his disdain for such sites with SuperTalk Mississippi's Matt Wyatt. "It's really an insult to coaches and to players at institutions. Whether they're putting websites out to hire you or fire you or do all these different things, I don't think that does any good for anybody," he said. "At the end of every season, there are coaching changes, but people put so much in. You're so committed, yourself, your family, your team, everybody's so committed, that I think it's insulting to the job everybody does. "I know there are fans that like that stuff. I don't think that stuff is great. People can have their opinions and call in on shows, but to take it that far, I don't think it's good for anybody on either side of the fence." Mullen also pointed out that he was the target of a website calling for his firing while serving as offensive coordinator at Florida, as well as one calling for his firing from Mississippi State last season. "I know there was a website here at Mississippi State to fire Dan Mullen last year. Now there's probably one to keep me here," he said." Mullen also gave his support to Muschamp, and said that he had no plans to leave Mississippi St.